This tour starts in Victoria, but first we had to get from our house to Victoria. Transportation from Seattle to Victoria on the Clipper was included, but the 7:30 AM departure meant we had a 6:30 AM arrival time and an even earlier meeting time. Since Bicycle Adventure is headquartered a couple of miles from where we live, we headed there first and they graciously took us to Seattle to make our logistics easier. Us == me, my wife Kim, and my daughter Samantha. Except the early hour, the trip up was uneventful; at 30 knots, the Clipper is nice and fast and all of our luggage and our two bikes arrived in great shape. Our hotel was an easy walk from the ferry dock, and we stashed our bikes and luggage at the hotel and had a quick lunch of wraps in a nice shaded spot under the trees. We got to know our guide, Noe, and the other two cyclists on the trip, Percy (not his real name) and Grace (not her real name). Most of the guided rides we have done have been on the larger side – 12-25 people – and have had three guides. This one was planned with two guides, but due to logistical problems (many guides head back to other jobs in September), we only had one guide. It was a little weird only having six people total, but we knew about it ahead of time, so it was fine. That afternoon, those using the BA bikes got fitted out and we went for a short ride; just a quick out-and-back on one of Victoria’s many bike trails. This helps those who have not been on a bike recently get their legs back and for the guide to get a better idea of what the group is like. The ride was 14.8 miles and 334′ of up; a nice warmup after a lot of sitting on the clipper. Dinner that night was in the restaurant in the hotel – Aura. The tenderloin was small and quite overdone and the pork belly was underseasoned. I don’t get why you would use sous-vide on pork belly; the whole point of sous-vide is not to overcook your protein and the pork belly is all fat and benefits from higher heat. I think they got the cooking methods backwards. Not horrible for $24 Canadian, but this continues a trend that I’ve noticed; restaurants attached to hotels tend to be a bit disappointing. That, and trendy cuisine is mostly wasted on me; after a ride I’m looking for something a little more substantial. Breakfast this morning was eggs and bacon, and then we packed up and headed out on the ride. This ride has two legs; there is a trip from Victoria to Butchart Gardens, and then a trip from the Gardens to the ferry near Sidney. At that point Percy and Grace decided to van to lunch and IIRC Samantha went with them, and Kim and I kept riding. Eventually we made it to the gardens, and although we ended up having to recruit most of the staff to find the van, find them we did. I had visited the gardens in my youth, and remembered them as very big, but apparently we just went very slow, as Kim and I went through the majority of the areas in about 45 minutes. Many of the flowers were unnaturally large; Kim guessed excellent care and lots of fertilizer and I guessed cobalt radiation, but overall the effect is very nice. Here’s a taste of what we saw (this is the “sunken garden” section). That clump in the middle has a little viewpoint that you can climb up into, thereby reenacting the rebel lookout scene from Return of the Jedi. As you can see, a perfect match; delta differences in foliage, the height of the lookout, and the number of X-Wing fighters. Now I know why Kim was shaking her head. Anyway, we headed back to the van and had a nice lunch of salad and shredded chicken in the shade under the trees. Then it was time to mount up and head towards the ferry. Samantha, Percy, and Grace chose the shorter and less hilly “direct route”, and Kim and I chose the longer and more scenic route. It was nice for the first 5 miles or so, and then Kim started getting cramps in her quads. I have a tic-tac box of electrolyte pills that I carry that were perfect for this, but I had cleverly left them in my luggage as this was a short ride for me. Kim was fine on the flats and descents, but on the steeper ups she would walk and I would push the bikes up. This gave us a bit of anxiety because we had a ferry we needed to catch – we weren’t in danger of missing it yet but it was getting tighter. At one point I saw a “Ferry” sign, pulled out the detailed map I had, and figured out we could take the direct route to get there. Oh, and we managed to reset our Wahoos to use the direct route, quite the feat when you have old person eyesight like we do. A quick stop at a store to get Kim some salt-laden cheetos and both of us a Coke Zero, and we made it to the ferry without incident. Only to find our ferry was late, so we grabbed dinner at Stone House Pub, a pub sited in a stone house. Hence the name. I had the Stonehouse burger with cheese, bacon, and mushrooms, and a side salad. Yum. The ride ended up with 43 miles and 2411′ of up. Despite the cramps, Kim puts in a really nice effort for the distance and amount of up. We catch the ferry to Galliano island, where we stay in the Galliano Oceanfront Inn and Spa. It was a nicely updated but kind of older and funky place, which is at least wheelhouse-adjacent for me. Except for lighting that was never updated after the energy crisis of the 1970s (ie “dark”), it was nice place, and we had a little patio that faced the water. After two eggs and bacon for breakfast – you probably sense a pattern here – we grab a ferry to Mayne Island, which is a small island. We van up the first hill, and then start riding around the island. Before the first mile is done, we hit a nice 19% hill, which sets a pattern for the rest of the week. If you’ve ridden the San Juans, the Gulf island roads are both hillier and steeper. My climbing legs are fine and I overall feel good – and I know today is going to be less than 20 miles – so I spend some time working on sprinting and waiting. The morning I’m riding with the wife and offspring, so I climb and wait, and sometimes double a hill. We descend back down to the water on the East side of the island, and pull into the Bennett Bay Bistro for lunch. I have the Santa Fe salad, which is pretty good. We climb back out for our ride to the ferry; I wait after the first hill and tell the wife I’m going to do an optional section. I ride off and immediately miss the turn to the optional section, so I just ride the rest of the route down to the ferry and the climb back up from the ferry to find the group. Percy and Grace pass me on the downhill, and after I start to head back up the hill I hit the wife and offspring. Offspring turns off towards the ferry, and I redo a little loop with the wife. The ride ends up with 17.1 miles and 1991′ of up. Anything over 100′ per mile is pretty hilly, and though I missed the optional part – which was only about 3 miles long – I did a nice hard ride. We ferry back to Galliano. Dinner is at the Atrevida – which Google translate tells me means “cheeky” in Spanish – restaurant where we are staying. I order the Goat Cheese Wild Mushroom stuffed chicken breast. Cheeky it is, for when my plate shows up, it is a breast with a small thigh attached to it, and it can’t weigh more than 4 ounces. There is a tiny amount of stuffing, and as far as I can tell, no goat cheese at all. The wife takes pity on me and gives me a piece of her rack of lamb, which is nicely done. I go back to the room and snack on the bag of nuts that I brought along, because I’m still hungry. I’m now 2 out of 2 for disappointing hotel food. Today we are going to ride around Galliano Island. I decide that two eggs isn’t enough so I order 4 eggs and ham, and gladly eat the 4 eggs and bacon that show up. They’re nicely done, so I’m fine with it. My plan today is to ride solo in the morning and take it from there. I’m going to do the long spine and then an optional section and maybe a quick out-and-back before our lunch at lover’s leap. The first climb is over pretty quick; I feel a bit heavy in the stomach from the big breakfast but that settles down and I start making time. I hit a turnoff down to the water and head down and the crappy road gets crappier and crappier, deteriorating into totally torn up pavement at the bottom. I take a picture at the bottom, and then head back up the crappy road and back onto the route. I can fit the bike under it, so it obviously doesn’t mean me. Another mile or so, and I come to a signed private drive. While I’m generally adventurous (not really, but that’s what I tell myself), ignoring that sort of sign in a foreign country seems like the wrong thing to do. I don’t think organized group rides should involve that sort of thing. I ride back and hit the main route where the van is waiting and Percy and Grace (still not their real names) have just arrived. My family has turned down the turnoff to the water I did earlier, so I head back to find them. I blow by the turn, ride for 5 minutes, stop, pull out my map, ride some more, and finally get about halfway back to the end before I figure it out. I turn around and time-trail my way in the correct direction, and get to lunch about 10 minutes after my family pulls in. Lunch is wraps (again), so I eat the filling of a couple of wraps, drink a caffeine free diet pepsi (ie brown flavored water), and rest while the rest of the group watches a pod of orca go by, trailed by an assortment of whale-watching boats. The family gears up and heads to the northeast end of the island. We drop the offspring at the van on the way back, and then head out on the last 13 miles with the wife. Kim does well until we descend to Montagne Harbor and need to climb back up; there’s a steep hill (say, >17%) that climbs up about 300′. I scout ahead while Kim walks, and then I return to tell her that it’s not that far, and pretty soon we are at the Hummingbird Inn to load the bikes up and have a snack before the ride back to the ferry. I have the traditional post-ride snack; a diet coke with a side order of cole slaw. Given my extra bit of riding, I end up with 50.7 miles and a significant 4745′ of up for the day. Because it’s past labor day (many restaurants have closed) and we have a tight timeline to hit the ferry, we get dinner from an Indonesian/German food truck on the ferry dock. I play it safe and have a decent hamburger. We get the ferry and head over to Pender Island, where we are staying at Poet’s Cove Resort & Spa, “where inspiration lives”, along with a bunch of people with really nice boats. Apparently the poetry gig is paying better than I thought. The rooms are nice and we have a view of the bay, and they also feature sliding doors that lets you sit in the bathtub and look out at the bay. Which is fine in concept, but they decided to use doors with slats that face down and frosted glass in the shower area, which means that you can’t use the bathroom in the middle of the night without lighting up the whole room. Things like that really bother the designer in me. I like time on my bike more than most people, but after 4 days of riding, I’m ready for a day off the bike, and today is the day. Today’s breakfast features a custom omelette with a lot of veggies, and since omelette was small I add a plate from the buffet with some more eggs, some bacon, and 12 blueberries. We van over to the harbour to Pender Island Kayak Adventures, and spend a really nice three hours paddling with a great guide; definitely a nice and relaxing experience. I also learn that paddleboards are called “SUP” in Canada; I had previously refrained from asking, “What’s SUP?” to my companions with great difficulty. Lunch is at the Port Browning Marina. Service is a little slow but I really like my steak salad, except for all of the tortilla chips that I forget to ask them to leave off. We van back and have the afternoon to ourselves; I gaze longingly at my bed and decide instead to head to the fitness center for a light workout and then a soak in the hot tub. Dinner that night is it Syrens Bistro & Lounge in the resort. We get a place on the terrace, and I order an artisan green salad and the sockeye salmon. I feel compelled at this point to engage in a brief exposition on the proper cooking of salmon. The proper way to cook Sockeye is to heat it so that it is barely set on the interior, just enough so that the interior texture is no longer raw. It is delicious. Before you accuse me of stacking the deck by ordering the salmon, I do not expect the Sockeye to be cooked properly. What I expect to get is what I call “tourist cooked”, which is the way that you cook salmon if you are serving it to tourists who might not like their salmon to be “raw”. Instead of just set on the interior, it’s cooked so that the interior is obviously done. If you think of it as the “medium” of steak, you’re pretty close. The texture suffers, but it’s okay. What I get is the salmon equivalent of a well done steak, way past tourist. I do applaud their consistency; our guide has salmon that is cooked the same way. I really should send it back, but I eat it anyway. About 10 minutes after that, my salad shows up. So, that’s a perfect 3 out of 3 in poor dining experiences at the places we stayed at, a pretty strong confirmation of my theory (p = 0.05). Our last day dawns a bit wet, and it’s still misty outside. I have my very predictable omelette/eggs/bacon breakfast, though I think “what the hell?”, it’s vacation, and go “outside the box” and have pineapple instead of blueberries. The original plan is to bike a little, do a hike and eat lunch and the top, and then bike to the ferry. But the road are a bit too wet to ride, so the Gunnersons van up to hike. We start turn off at the eponymous Mount Norman Access Road, and start the hike. Or we would have done that, if it weren’t a foggy day. What we did instead was look out at a vast sea of whiteness, watching for the short periods of time where trees or water were vaguely visible. But it was still a nice hike. We returned to the resort for a quick lunch, and then it is back on the road. Kim and I are the only cyclists for the day. 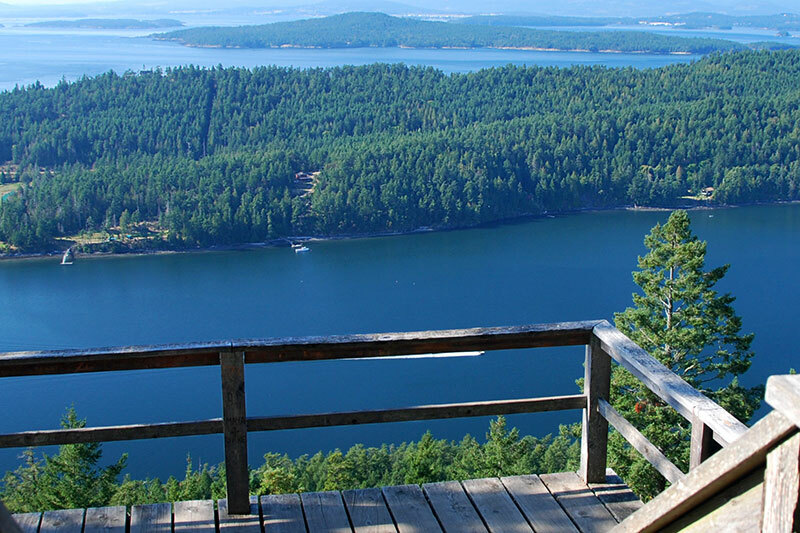 One side trip takes us to a view, another takes us to a park that we are unable to locate, and we roll off of South Pender Island onto North Pender Island, and hit a killer hill. I haven’t mentioned it earlier, but Kim and Samantha have really been excellent sports on what has been a trip with a lot of steep hills, and not just steep in the 10% range, but steep in the 13-15% range, with a few steeper. The Otter Bay ferry terminal. We get there about ten minutes before the van shows up, and then the bikes go in the trailer and we get in line. The ride for today is another short one; 16.4 miles with 1427′ of up. I’ve been meaning to mention the ferries; the BC ferries run some very tiny boats, and then the run some big new boats. That clamshell in the front is raised up for loading, and the lowered down for the trip. That allows them to operate ferries in much rougher weather than we see in Puget Sound. In the middle of the entrance, you can see a raised part sticking up. The ramps lead down to the second car deck which is underneath the main one. Load it up, close the ramps, and the lower car deck is totally enclosed. A neat design. All the exterior doors on the passenger decks are heavy and power operated so they can seal tight. The ferry ride takes us to Tsawassen, and we overnight in a hotel near the airport. In the morning, we leave at 6AM to van back to Redmond. Our border crossing takes two minutes; I am grateful that it is short but wonder what our border agent was thinking letting a van and a totally enclosed trailer through so quickly. Overall, it was a nice vacation. I liked the rides but the ferry logistics can be a bit tedious at times as you have to get to a specific place at a specific time, and I would have liked more bike time – or at least more options – on a couple of days. Our guide was great.